E-mail written 2000-2008 to Lew Griffin & Warren Culpepper from Betty Jean Thomas Bailey (Mrs. John Lester Bailey Jr.), e-mail address. Ohio Military Men, 1917-1918, Online database at Ancestry.com, 2000. 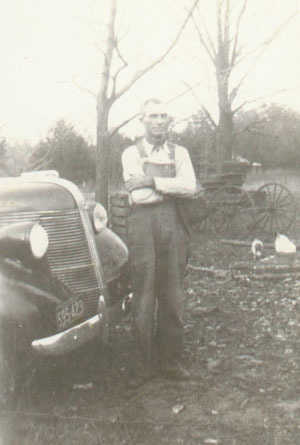 Erskine Cullpepper, Lodger, M, Wh, 24, sng, AL/AL/AL, Timber Inspector. E-mail written 2008-2009 to Warren Culpepper from Eileen Culpepper Rousseau (#40424), Piqua, OH, e-mail address. Jean Culpepper, Daughter, F, 1 2/12, sng, OH/TN/KY. Eileen Culpepper, Dau. F, Wh, 7 1/12, sng, OH/AL/KY. Coleman C. Temp?, Brother-in-Law, M, 25, S, TX TX AL, Laborer-Oilfields. Jessie J. Culpepper, Step Dau, F, 28, S, AL AL AL, Teacher-Pub School. Ernest L. Culpepper, Head, M, 35, M, md @ 30, AL/AL/AL, Mauler/Stove Mfg Co., WW-I Vet. Guy B. Culpepper, Son, M, 2 10/12, S, GA/AL/AL. Ernest L. Culpepper, 23, M, Sng, AL/AL/AL, Sergeant. Ernest L. Culpepper, d. 14 Mar 1979 at 84 years in Bartow Co., GA; Res. in Floyd Co., GA.
E-mail written 1999 to Lew Griffin from Connie Syubbs Schiller, e-mail address. Lucy Culpepper, Dau, F, sng, Wh, 6M, AL/AL/AL. Mattie Culpepper, Daughter, F, Mar-1898, 2, S, TX AL MS.
+ Nicey Culpepper, 20 Apr 1840 - 22 Feb 1918. Annie Culpepper, Daughter, F, 3, S, TX AL MO. E. F. Culpepper, Harris Co., Feb 7 1914, 3626. Nicey Culpepper died 22 Jan 1918 in Henry Co., Alabama. J. D. Culpepper died 10 Nov 1919 in Morris Co., Texas, Cert-33172. Joseph Mandeville Culpepper Sr., 6 May 1862 - 12 Dec 1934. J. M. Culpepper and Bessie Mandeville on 24 Aug 1887 in Clay Co., GA by J. H. Corley, M.G. Joseph Mandeville Culpepper Jr., 14 Jul 1888 - 25 Jan 1965. Thomas McK. Culpepper, Son, M, Jul 1898, 1, S, GA/AL/GA. Thomas McK. Culpepper, Son, M, 11, S, GA/AL/GA. "Nordan is the Name" by William W. Nordan, on pages 41-42 of Henry's Heritage: A History, Volume I.
T. D. Culpepper (M) married N. J. Nordan (F) on 1 Jan 1885 in Henry Co., Alabama, Book 1884-1889, page 48. E-mail written Feb 2005 to Warren Culpepper from Scott Dawsey, e-mail address. Name "Isaac Williamson Culpepper" off his tomb stone in Ft. Gaines, GA. Isaac married 2nd: Ms. Ada Permelia Dawsey, born 14 Oct 1888, Henry Co. AL, died 26 Jun 1980, Dothan, Houston Co., AL. 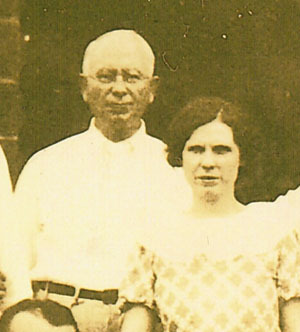 They married 20 Feb 1913, Hartford, Geneva Co., AL (at the home of John Franklin and Nancy Candace Tucker). This is where Isaac also died. Ada is buried in the Dothan City Cemetery, Dothan AL along with her parents and sister. Clyde H. Culpepper, Wife, F, Sep 1870, 29, md 0 yrs, ch 0/0, GA/TN/GA. Clyde Holland Culpepper, 5 Sep 1870 - 27 Jul 1909. Isaac W. Culpepper, Boarder, M, W, 40, Wid, AL/AL/AL, Merchant/Retail Dry Goods. Ada Culpepper, Wife, F, 31, M, AL/AL/AL, Milliner in Dress Shop. 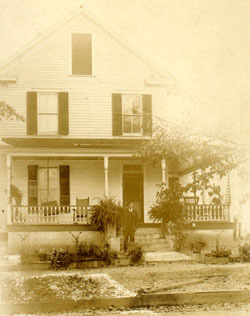 (Note that Isaac and Ada Culpepper were living in the same residence as John and Nancy Dawsey. Since Ada's maiden name was Dawsey, most likely John and Nancy are her parents). Isaac W. Culpepper died Jul 1935 in Geneva Co., Alabama. Lucile Culpepper, Niece, F, 9, GA/AL/GA. Mattie Culpepper, Wife, Wh, F, Feb 1876, 24, md-2yrs, AL/AL/AL. 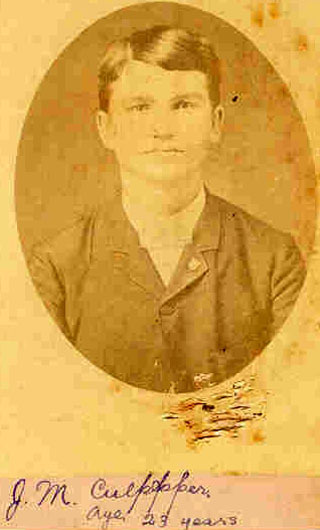 John W. Culpepper married M. A. Johnson on 28 Oct 1897 in Henry Co., Alabama, Book 1897-1900, page 134. Martha J. Culpepper died 5 Nov 1914 in Geneva Co., Alabama. + Mattie Johnson Culpepper, 3 Dec 1877 - 5 Nov 1914. J. W. Culpepper, Roomer, M, 57, Wid, AL/AL/AL, Truck Driver. 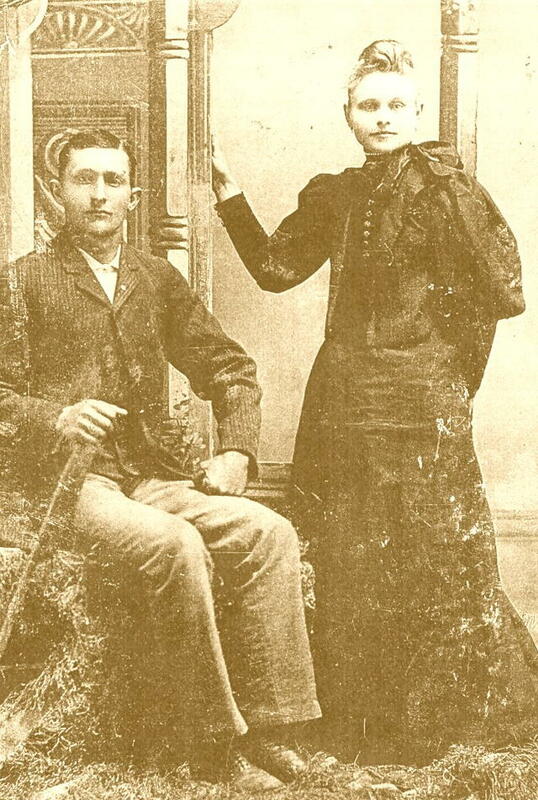 Carrie Culpepper married M. E. Petty on 8 Dec 1889 in Henry Co., Alabama, Book 1889-1893, page 46. Roll 15 Book 3, Page 91b. Robert Lee Culpepper, RFD #1, Abbeville, Henry Co., AL, Age 41, born 8 Sep 1877, Caucasian, Farmer for self; Wife: Doria Alberta Culpepper; Medium Height, Medium Build, Brown Eyes, Black Hair; No Disabilities. Signed 12 Sep 1918 in Abbeville, Henry Co., AL. Ella E. Culpepper, Daughter, Wh, F, Aug 1883, 16, sng, AL/AL/AL. Elton Culpepper, Son, M, Wh, 3, sng, AL/AL/AL. Lily G. Culpepper, Daughter, F, Wh, 7, sng, AL/AL/AL. + Bertha Eudora Culpepper, 15 Apr 1884 - 14 Oct 1945. Dora Culpepper died 14 Oct 1945 in Houston Co., Alabama. Robert L. Culpepper died 31 Jan 1957 in Henry Co., Alabama. "Eddie Hickland and Valentine Culpepper Hall", page 175. Jesse Culpepper, Son, M, sng, Wh, 1, AL/AL/AL. Bland report, Troy N. Bland to Lew Griffin, 2000. 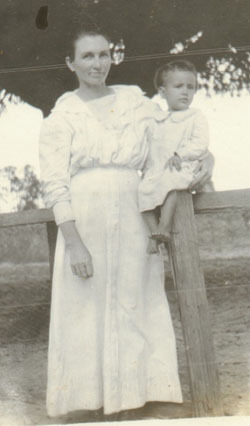 Lula E. Culpepper, 1871 - 1955 - Mother. Thomas J. Culpepper, 12 Jan 1845 – 12 Nov 1895. Addie B. Culpepper, Daughter, F, Apr 1892, 8, S, TX/AL/TX. Ruth Culpepper, Daughter, F, 3, S, TX AL TX. Ruth Culpepper, Dau, F, 13, S, TX AL TX. Martha A. Culpepper, 17 Jun 1843 – 10 Jan 1922. Martha Culpepper, Smith Co., Jan 10 1922, 2758. Ruth Culpepper, Dau, F, 22, S, TX AL TX, Teacher-Pub School. Lula E. Culpepper died 18 May 1955 in Smith Co., TX. Charles Thomas Culpepper died 25 Feb 1961 in Smith Co., TX. Jesse Culpepper, 2 May 1879 – 3 Jul 1912. Minnie Culpepper, Wife, F, Mar-1884, 16, md-2 yrs, Ch 0/0, TX TX TX. Robert L. Culpepper, Son, M, 5/12, S, TX AL TX. + W. Oscar Culpepper, died 12 Dec 1939. Obituary of Robert L. Culpepper (#6377), published 2 Jan 2008. Lavonia White, Dau, F, 1 6/12, S, TX TX TX. E-mail written Jun 2006 to Warren Culpepper from #6089) Janice Wood (granddaughter of Carl Alton Culpepper, Phone 815-544-9570, e-mail address. H M Culpeppe, Father, M, Wh, 72, md, unemployed.